Dr.Girish Gupta, recipient of many national and international awards, member of Central council for Research in Homoeopathy recently presented a paper on fibroids at resurgence 2004 seminar held at chennai. He presented many cases with evidence-based documents. Here we give a case of fibroid presented by him. He has a scientific approach with determination to do “something significant” and redefine Homoeopathy on modern scientific lines. A thirty-eight years old female patient, having two children born on caesarians consulted me for menstrual complaints. She had irregular periods with profuse bleeding with pain during every period since six months. The patient had undergone tubectomy and has had two spontaneous abortions. 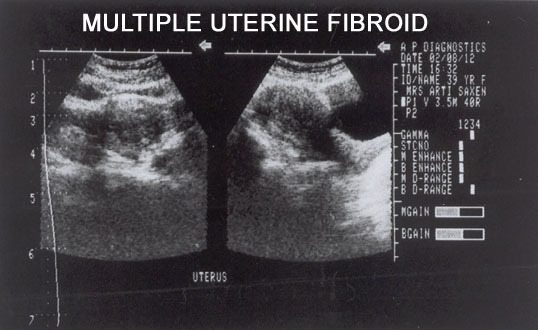 Ultrasonography of pelvis dated August 12, 2002 revealed bulky uterus with multiple echogenic focal parenchymal masses in uterine pulp suggestive of uterine fibroids. Arsenicum album and Magnesia sulphurica were selected from various drugs of choice. Arsenicum album 1000 single dose was prescribed followed by Magnesia sulphurica 30 for eight weeks. 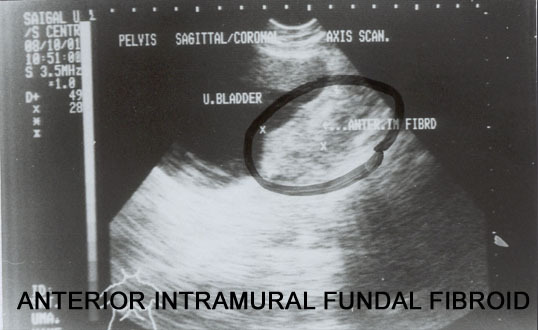 Ultrasonography of Pelvis (12-08-2002) : Bulky uterus with multiple echogenic focal parenchymal masses in uterine pulp suggestive of Uterine fibroids. Ultrasonography of pelvis dated December 14, 2002 showed normal Uterus with no trace of fibroids after four months of treatment. 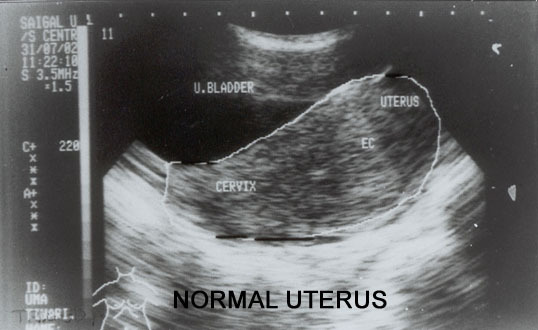 Ultrasonography of Pelvis ( 14-12-2002) : Normal uterus. No evidence of any Fibroid. A twenty seven years old multiparous female patient with two normal deliveries, consulted me for her lower abdominal pain, Her periods regular and her sufferings since three months. Nothing remarkable was noted in her past history. Family history revealed Anxiety neurosis in father. Ultrasonography of pelvis dated October 08, 2001 revealed anteverted Uterus measuring 90 X 53 X 40 mms in size with hyperechoic endometrial cavity and heterogenously coarsely textured thick fundal walls. An oval shaped echogenic lesion measuring 50 X 30 mms was seen fused with the anterior wall of uterus. Cervix is thick and unevenly textured. Adnexae were displaced with mild fluid in Pouch of Douglas. The case was repertorised. Symptoms considered for repertorisation were religious dreams, dreams of feasting, of water, of dead relatives, of dead bodies, of unsuccessful efforts (Magnesia sulphurica), ailments from mortification and humiliation, fear of ghosts, robbers, misfortune, high places, sympathetic, offended easily, sentimental, want of self confidence, desire for open air, weeping disposition which aggravates the symptoms, remorse, introverted, anger easily and desire for salty things. Natrum muriaticum was selected from various drugs of choice. Natrum muriaticum 1M single dose was prescribed. Followed by Placebo for six weeks. Ultrasonography of Pelvis ( 08-10-2001 ) : Anteverted Uterus measuring 90 x 53 x 40 mms with hyperechoic endometrial cavity and heterogenously coarsely textured thick fundal walls. An oval shaped echogenic lesion measuring 50 x 30 mms seen fused with the anterior wall of uterus. Cervix is thick and unevenly textured. Adnexae were displaced with mild fluid in Pouch of Douglas. Irritability and weeping also reduced. Only Placebo was repeated for four weeks. Pain lower abdomen initially reduced but increased in intensity again. Pain and heaviness head was reported by the patient. Natrum muriaticum 1M single dose was repeated followed by Placebo for eight weeks on different visits. Pain lower abdomen, fear of ghosts, robbers, misfortune, and high places much reduced. Pain lower abdomen, fear of ghosts, robbers, misfortune, high places initially reduced. Natrum muriaticum 1M single dose was repeated followed by Placebo for ten weeks on different visits. No pain lower abdomen or fear. 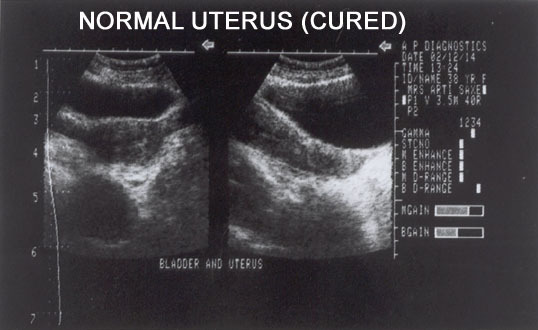 Ultrasonography of pelvis dated July 31, 2002 revealed normal Uterus after 9½ months of Homoeopathic treatment. Ultrasonography of Pelvis ( 31-07-2002) : Normal uterus. No evidence of any Fibroid.